Can not flash right through the programmer diferent full-dump? So it *MAY* be an AX206-chip (I can not see any markings on the chip itself). BUT: the firmware was not build with the Buildwin SDK for AX206. Identify.py needs a fw build with this SDK to extract lcd-access & init routines. Without these infos it's not possible to build a custom fw for your dpf. This is a picture frame that was hacked 4 years ago with the help of hackfin (http://tech.section5.ch/news/?p=77) and has since been lying in a cupboard. It does not seem to work with the current distribution of the dpf-ax toolkit. So I would like to upgrade it to a more modern firmware, if possible. See below for command output of lcd4linux and identify.py. dpf_ax ERROR: bulk ACK read. But the following model has a partial signature match: avlabs_avl969s. That did indeed do the trick. Thanks a whole bunch! I think hackfin used to call this device 'pink'. It looks exactly like the one on his website (see attached picture), although mine has black plastic. 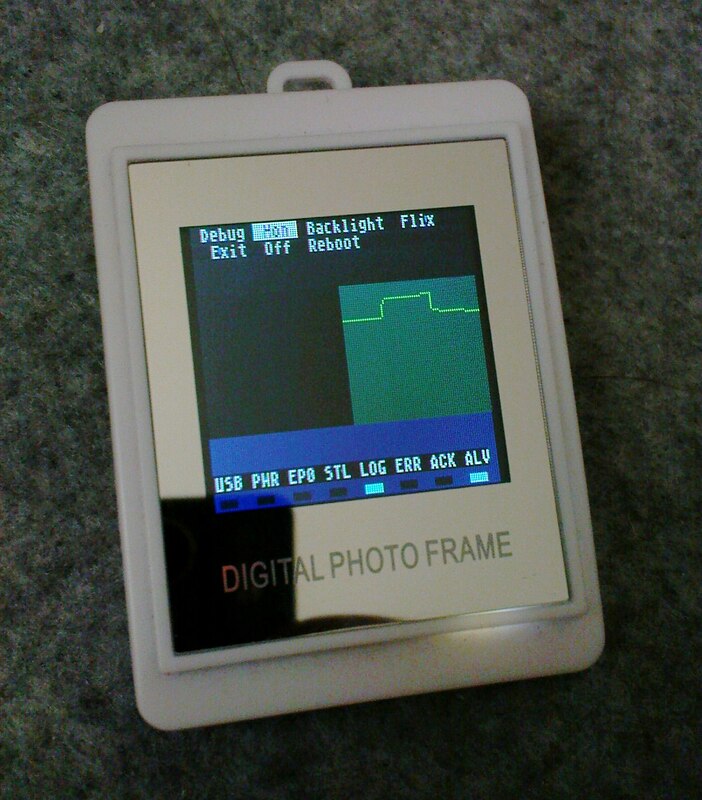 The front simply reads 'Digital Photo Frame'. "Pink" was a generic name, which I removed a while ago. So it will stay "acme_8". Hi got a August Mdel DP 150L Display from amazon. I allready tried all the clas_ohlsen firmware you have. But i only see 70 Percent of the starting picture coverd with roll eyes splash screen. The rest of the Display still seems to be the old starting page on it. Looks like the size doesnt cover the hole display...can you help me ? Thanks a lot mate , the whole screen is covered now......you are doing a fine job !! So I will add it as "august_dp150l". I haven't dared to flash one of the alternative firmware. I hope you can prepare a suitable firmware for this device. Thank you. That was quick, the firmware works great, contrast and brightness range is fine, thanks! One minor issue is that 'off' from the menu doesn't turn off the device, it seems to do the same as 'reboot'. Not a big problem as it's going to connected permanently anyway. So I will add it as "sweex_mv004v4". But the following model has a partial signature match: clas_ohlson. there is a compatible model that I have not yet uploaded to the svn (shame on me). Dear superlelchi,your firmware work perfectly when the dpf is attached to a pc but, when i attach it to my router asus n55u with entware packages I obtain the following errors then the frame reset itself. I tried various version of lcd4linux, all with the same effect. Do you have some suggestions ? Your lcd4linux version on the router is out of date. It has an old driver which may not be compatible with the current dfp firmware. The new dpf-driver (written by yours truly) was added in rev 1199. The router has rev 1193. Please try attached fw. Make sure brightness & contrast setting work. Do you have a name / supplier for this dpf? Else it will stay acme_9. invoked without full path; restart may not work! If the driver is okay, may be it is the usual problem - bad USB connection? You know that the cable that comes with the dpf is crap? Have you tried another USB port and / or a shorter / better USB cable? Also it may be a power problem. You should try to connect the dpf over a powered USB-Hub. Flash written to file 'fulldump_win_20150428-130840.bin'. It would be nice if you can help me to hack it. A look at your fw-dump shows "AX208 SDK V3.0" - so another one that is AX208 based, not AX206. And dpf-ax only works with AX206 chips based on the Buildwin SDK for this chip. I bought a DPF because somewhere it was listed to work with the hack. Does anyone know how to get the display in bootloader mode? Edited 2 time(s). Last edit at 05/16/2015 10:48AM by newmats. 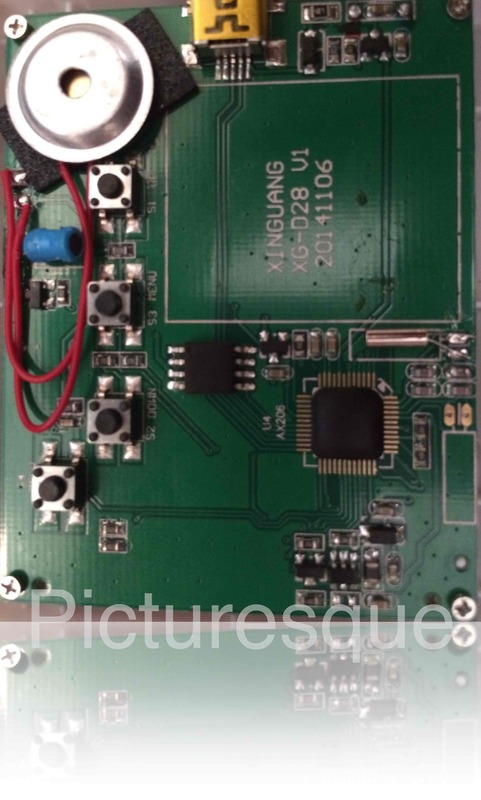 Dpf-ax only works with AX206 chips based on the Buildwin SDK for this chip. Your dpf is not an AX206 or not based an this sdk. - Hold the menu button and connect the dpf to USB. Works like reset + menu. EDIT: I will remove the link for the winplus - the sold dpf on this page is a "new" model. Sadly not compatible with dpf-ax. Edited 1 time(s). Last edit at 05/17/2015 05:11AM by superelchi. thx very much for your quick response. Looks like all newer devices are based on AX208. I got one and now I'm stuck with it. I can't even get into bootloader mode with reset + menu. From the hardware specs of the AX208 (first hit on Google) it doesn't look that different from AX206. What's required to make this work?